Details of Captains Day is now on the Club notice board - Sat Sept 15th, please sign up for golf and evening tickets. Remember you can bring your non golfing pals to the evening dinner at £30 p head. Pay in cash on the day please. There is also a raffle to win one years FREE membership of the club. Tickets are £5 each and I will start selling them when I come back from hols next week! Good prize! Also, I am looking for 2 more players for my team that day so please don't be shy!!! The Autumn Meeting/Chris Leary Chalice tee sheet is filling up for September 20th. If you can't find a spot then please speak to Lin or Rogie and they will endeavour to help...Please remember to pay by the usual means. This Thursday sees the 1st Round of our Eclectic Cup, with the second round on September 6th. In spite of its name (Eclectic) BOTH rounds are qualifiers and you must therefore ensure that you putt out on every hole in each round and do NOT pick up as this will lead to disqualification. Please remember to sign in on the computer for both rounds. Good luck! 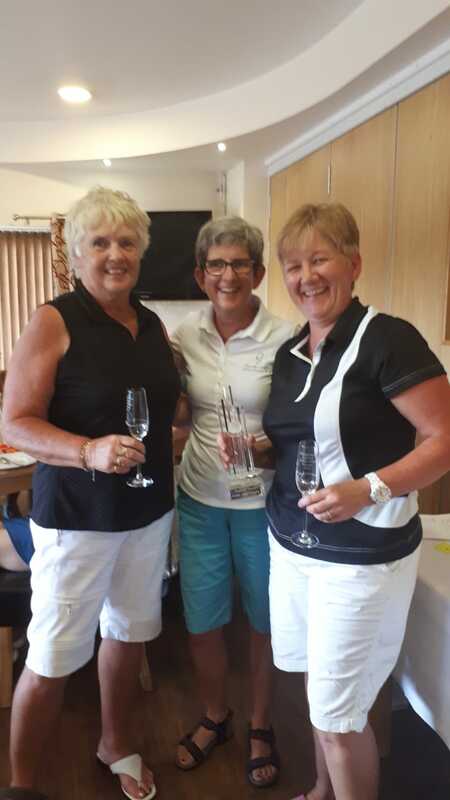 Congratulations go to Jacqui Harbor who won the weekend Stableford and to Vicky and Pauline who won their divisions in the Thursday Stableford. Although it seems some way off the Ladies Section AGM will take place on the evening of Nov 1st. Hopefully there will be free wine so please put the date in your diary. It is a fun evening with all the end of year presentations. In order to fulfill the rules of our constitution with regard to our AGM, we will be posting some notices on the board in the next couple of weeks, showing among other items nominations for Committee 2019. 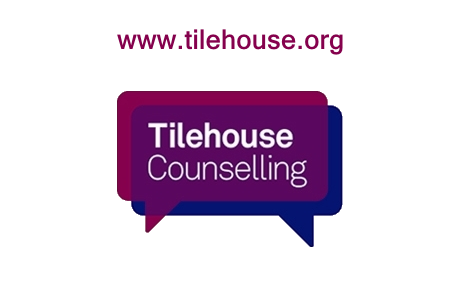 There are still some posts available so please consider a position on the Committee and have a chat with Margaret or any other committee members. Committee posts are really not as onerous as you might think, we actually have a lot of fun and it gives you the opportunity to get involved with your section. As we all know our Ladies section is the best but it doesn't happen with out the support of its members! 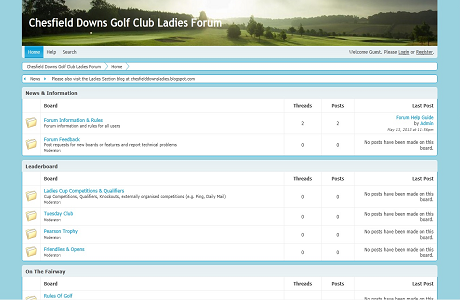 If you aren't aware you can read the Minutes of Committees and AGMs on the ladies webpage under the About Us tab. Off to sunny Granada for a week. I have put my clubs away. Instead, lots of history, Spanish red and tapas. Have a good week and good luck with your golf. Following some rain the previous week, we had a bit more last week. Seems Thursdays are prone to rain at the moment! However the course is starting to look a bit greener - every cloud has a silver lining! Because it poured down on Thursday we decided to postpone the Macknight Pairs and have now rescheduled it for TUESDAY September 18th. The competition will miraculously reappear on the system next week showing the same pairings and same tee times as last Thursday. However, in all cases please check the system and ensure that you and your partner are still available for the allotted tee time and obviously you can make any changes as usual. i.e. adding/ taking away your names or changing your time etc. Any queries please contact Lin but hopefully some of the original pairings will be able to make this rescheduled date. 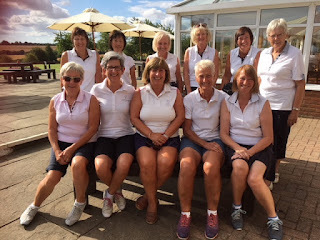 There have been a number of notable 9 hole winning ladies over the last few weeks and they too have had some handicap cuts. Julia Goodwin won BOTH stablefords in May and one in June, with Pam Blake taking top spot in the other June comp. Chris Leary won BOTH in July and Kay Baker won the latest August competition. 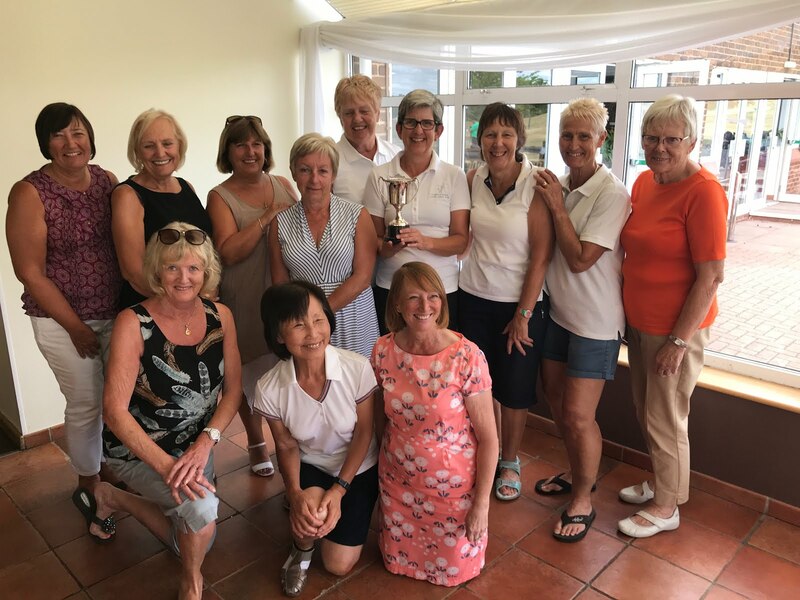 Well done to all our lovely 9 hole ladies. The sign up is on the system now for the Autumn Meeting/Chris Leary Chalice on Thursday 20th September. This is an individual stableford non qualifier off full handicap (Yippee! Thanks Chris!) the price is £18 for golfers and £16 for non golfers who just wish to come for lunch and the presentations afterwards. Further details will be on a flyer in the changing room next week. Payment in advance by the usual methods. Lots of prizes on offer that day and a raffle for the Air Ambulance. 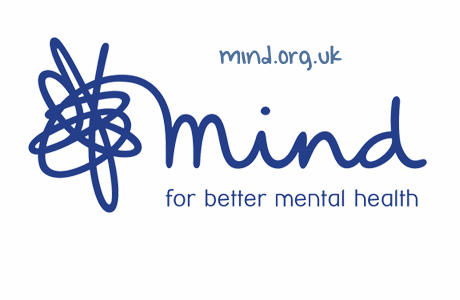 Should you still have any suitable raffle prizes (that you would like to win!) then please let me have them. Many thanks. On the down side this week it was disappointing that Virginia and I failed to qualify for the Ping Pairs finals. There were lots of massive scores and our 45 points wasn't even enough to make the Plate Final.....!! The inaugural Friendly was played at Redbourn on Friday and unfortunately ended with a 3-1 loss. The games were close and played in great conditions (some grass on the fairways!) and in good spirit. 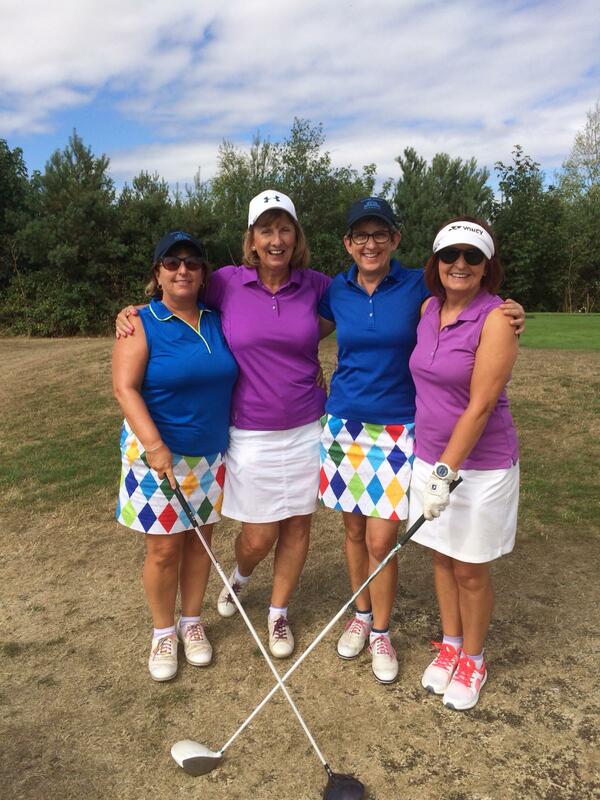 Thanks to all the ladies who played and a special well done to Maggie and Pauline who won their match. We look forward to welcoming the Redbourn ladies back to Chesfield next year. 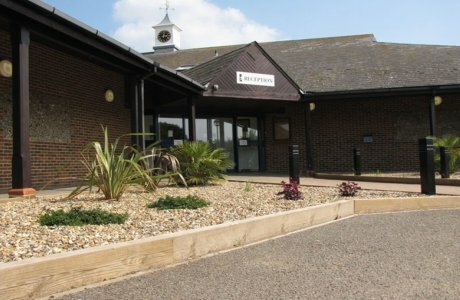 Jean Ray reaches a notable birthday at the beginning of next month and as a celebration she has very kindly arranged for us to join her for tea and cake after our golf on Thursday 13th September. I thought it would be a nice occasion to take a Ladies Section photo that day with as many of us as possible sporting our newish Foxglove jumpers. Please make a note in your diary to not only join Jean for her birthday celebrations but wear or bring your new Ladies Section Foxglove jumper if you have one! You are all welcome for tea whether you have a foxglove jumper or not and will be in the picture too. Let's hope it a nice day....!! Well, I think the heatwave might have ended, just at the time we went out to play the August Medal! I don't know about the rest of you but I was wetter than a big bag of wet things!! A welcome relief in some respects and good for the course and the garden....however I am always amazed at how quickly I get fed up with cool damp weather! A visit to Tina - the Musical was enjoyed by 10 Ladies and Allan Cook! I believe they were quite well behaved and thanks to Jackie R for arranging it all, it was fantastic...so was the fizz (by the looks of it) at a nearby bar. 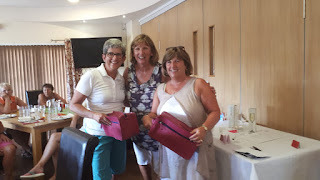 Pat W and Kathy Morris had a great day at Lutterworth Golf Club in the Regional final of the Coronation Foursomes Cup, they were only 10 putts behind the winners and came 32nd out of 99 pairs. A very creditable result representing Chesfield for the first time in this competition. Lots of golf has again been played this week, not least the match between the Ladies and the Senior Men for the Palmer Cup. David Palmer donated the trophy back in 1998 and it was lovely that both David and Lorraine were able to represent their sections this year. This is always a very closely fought match and this year it involved 6 pairs from each section. As the rules state, if the Senior Men win then they play off the white tees the following year. Last year they did win so it was the white tees for them on Wednesday. 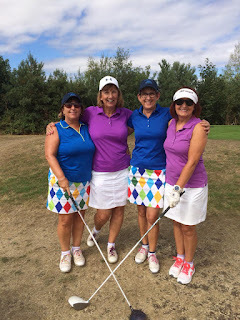 I am thrilled and proud to say that the Ladies won by a resounding 5 matches to 1, so the Men will be off the yellow tees next year! In spite of that we all enjoyed a lovely summer lunch together afterwards and were still speaking to one another....thanks to Brian F for arranging it all and to Pauline H for getting the Ladies team together. Many thanks for playing Ladies - you were awesome! Congratulations to all match winners in the summer knockouts. We have now reached the semi final stage of both singles and doubles so good luck to those left in the competitions. Jo Oliver is running Ladies clinics on either Mondays/Wednesdays. For exact dates and further details please see the notice board in the changing room. These sessions are a great way to move your game to the next level, increase your confidence and hone your swing and are a steal at £7. It was the 2nd round of the Summer Eclectic on Tuesday - hope you all managed to reduce your overall score by a few strokes. Still 2 more rounds to go. Sign up is on HDID. 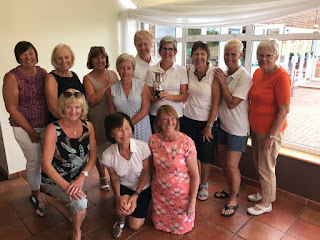 Then the great rains arrived and we played the Monthly medal - a number of drowned rats managed to finish and Division 1 was won by yours truly whilst Linda Brown won Div 2. Next Thursday we will be playing the Macknight Pairs Scramble competition. Please collect a copy of the rules when you collect your cards and don't forget to sign in on the computer. 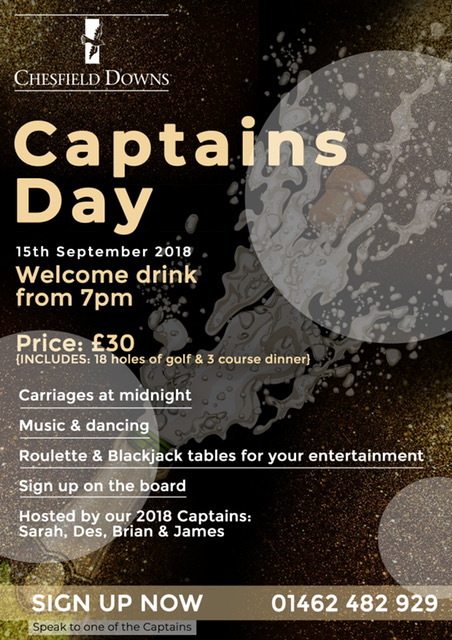 And don't forget Captains Day on September 15th. Sign up and further details will be up this week on the Club Notice Board. Any queries please ask me or another member of the committee. It's a day of golf followed by evening dinner and entertainment. Enjoy the cooler weather but may the sun still shine! The Away Day on Thursday was a fantastic day and I am so grateful to everyone who came and played in very hot conditions. The Bedford Club was an excellent choice and they looked after us all very well. Although it was hot there were some good scores and Helen and Nikki came out tops with Jackie and myself the runners up. We played for the Kelland Pairs Trophy, and although Marica was unable to be with us to present her trophy, it was awarded in her absence with some beautiful engraved keepsake glasses. A big thank you again to Margaret and all who contributed to the day, making it another memorable event in my Captains Year. Earlier in the week we played the 1st round (of 4) of the Summer Eclectic. Plenty of time to improve on your first round. Please remember that when you are playing your first round (whether it was last week or this coming week) you must play it as a strokeplay game and putt out on every hole. Once you have completed that first round then you are trying to better your scores each week so can pick up in the next rounds if you can't make a lower score – hope that makes sense! Congratulations to Pam Blake who won the Adult Par 3 competition in July. This is the competition run by Jo Oliver on the Lannocks Course and is a stern test for all. 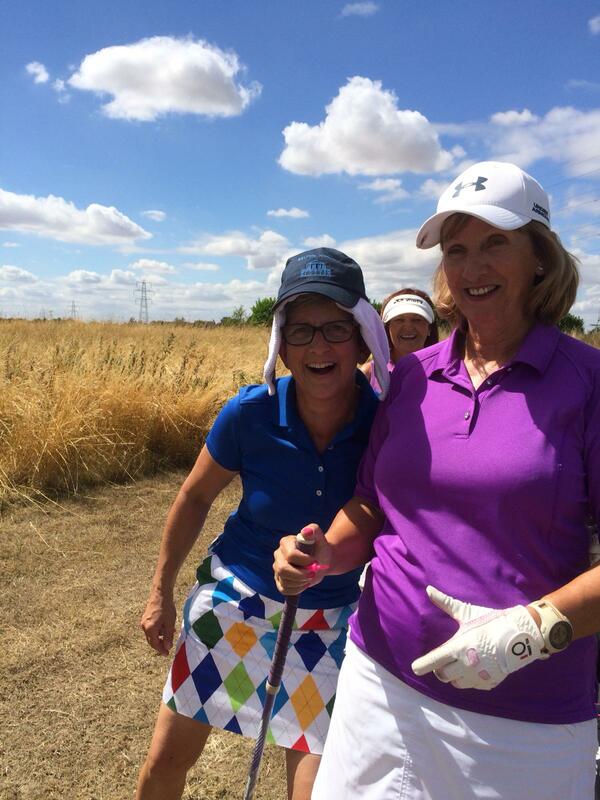 Well done Pam and I understand they docked you 2 shots on your handicap!!! Hot off the press, the Weekend Ladies played a medal on Saturday. Special congratulations to Lin who shot a nett 61 and had a handicap cut of 4 shots, to Julie Price who shot a nett 66 and is down to 12. I believe that Nikki and Megan also got a cut although not as big as they might have wanted, as the CSS came down again! Well done to you all. Wednesday this week brings the hard fought Palmer Cup match between the Ladies and the Senior Men. Last year this match had to be postponed in August because it was too wet but the Senior men won the trophy which means that this year they are playing off the White tees! 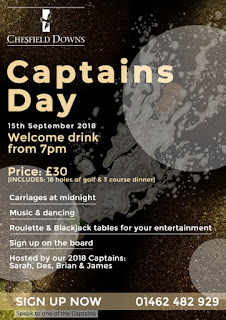 Captain's Day will be on Saturday September 15th. The sign upsheet will be up on the board soon. It will be a fun day with a dinner and entertainment in the evening. Please bring your non golfing partners/ friends for dinner in the evening. If you need more info at this stage please ask Margaret or myself but put the date in your diaries. Our Autumn Meeting will be held on Thursday September 20th. This competition will not be on HDID, so look out for the sign up sheet in the locker room later in the month. There will be lunch afterwards. Just had to include this photo of your captain sporting the latest in headwear for the hot summer!! Have a good week and keep playing well!